The environmental and societal benefits of urban green space have long been recognized, but such land use often becomes a secondary consideration in urban drainage modeling, in part because it is more difficult to obtain site specific data for model calibration. Singapore has re-branded itself from garden city to city in a garden and as such parks, urban forests, and even agricultural areas are particularly important in sustaining the liveability of this highly urbanized city-state. The objective of this study was to quantify the rainfall–runoff processes for a park in Singapore and explore the efficacy of PCSWMM in estimating runoff from a nearly 100% pervious area. Admiralty Park consists of two sections, one being a traditional urban grassed area with trees, outdoor exercise areas, and promenades; and the other being a forested nature trail that includes a mangrove habitat opening to the Straits of Johor. Infiltration rates, using a double O-ring infiltrometer, were measured at five sites within the traditional grassed area and samples for textural analysis were collected at the same sites. This part of the park is serviced by a tile drain and an ISCO 2150 area–velocity meter was installed near the drain outlet, together with a tipping bucket rain gauge, to monitor rainfall and runoff between 2013-12-21 and 2014-05-04. The soils were 80% to 92% sand and classified mainly as loam sand or sandy loam. The measured maximum infiltration capacity (f0) at Admiralty Park ranged between 140 mm/h and 850 mm/h, while for the fitted Horton infiltration equation, the estimated f0 values tended to be lower than those measured and ranged between 80 mm/h and 690 mm/h. In total twelve storms were deemed to have a complete data record, with rainfall depths ranging between 9.6 mm and 99.4 mm and peak intensities between 42 mm/h and 144 mm/h. There was a strong correlation (0.872) between total storm event runoff volume and total rainfall depth, but weaker correlations between peak rainfall intensity and peak runoff rate (0.234) or peak rainfall intensity and total storm event runoff volume (0.382). In particular, two storms measured shortly after the 1 in 140 y drought exhibited relatively high peak runoff rates. PCSWMM was calibrated for ten of the twelve events and validated for two events. The Horton infiltration equation was used to operationalize PCSWMM and it was found that the rainfall derived inflow and infiltration (RDII) unit hydrograph approach also was required to help match the observed hydrograph shape. For the Horton infiltration equation, the calibrated values of f0 ranged between 100 mm/h and 135 mm/h, while the values for fc, and α were the same for all events at 20 mm/h and 10/h respectively. The unit hydrograph values for T and K in the RDII calculations were the same for all events at 0.21 (h) and 1.2 respectively, while the value of R (proportion of the rainfall that is translated to RDII) ranged from 1% to 75%, but typically was around 40%. The calibration efforts prioritized matching peak over total event volume and for the ten events the Nash–Sutcliffe statistic was an excellent 0.98 for peak flow and 0.73 for event volume. Runoff estimates for the two validation events also matched measured flow quite well. PCSWMM appears to be well capable of modeling runoff from urban parks. The environmental and societal benefits of urban green space have long been recognized (Sanders 1986; Marsh 1991; McPherson 1992; Swanwick et al. 2003; Chiesura 2004; De Ridder et al. 2004; Sherer 2006; Fuller et al. 2007; Millward and Sabir 2011; Ng 2015). In North America, focus on urban green space planning can be traced back at least to the mid-1800s with the remarkable vision and park plans developed by Frederick Law Olmsted (Howett 1998; Rybczynski 1999). More recently, green space is being included as an indicator in some urban liveability and quality of life indexes (e.g. Leby and Hashim 2010; Okulicz-Kozaryn 2013; Ding et al. 2014; Arcadis 2015). Commonly used urban hydrology models, including PCSWMM, provide explicit consideration of hydrologic processes associated with green space (e.g. surface storage, infiltration, throughflow, evapotranspiration). Frequently, however, rigorous consideration of green space becomes a secondary concern in urban drainage modeling, in part because it is more difficult to obtain site specific data for model calibration. Pauleit et al. (2005) noted the lack of information on the environmental effects of urban change and the dynamics of green spaces, while James et al. (2009) concluded that provision and management of freshwater quantity and quality through green space needs to be further researched. Singapore’s garden city vision was introduced by then Prime Minister Lee Kuan Yew in 1967 with the initial phase being an intensive tree planting program along major roads and streets, as well as the camouflaging of concrete structures by creepers and climbers. By 1998 the garden city concept expanded into the current greening policy of city in a garden (http://eresources.nlb.gov.sg/history/events/a7fac49f-9c96-4030-8709-ce160c58d15c; Yuen 1996) and Arcadis (2015) specifically noted Singapore’s focus on green urbanization, scoring it highly in the green spaces category. Although comparisons must be viewed with caution because the definition of green space varies from city to city, formal green space constitutes 14% of Singapore’s total land area (https://greenimpactindo.wordpress.com/2010/11/23/park-connector-network-planning-in-singapore-integrating-the-green-in-the-garden-city/) while The Trust for Public Land (2014) reported the median parkland for sample high density population cities in the United States as 11.8% and sample medium density cities as 8.4%. By any measure, despite Singapore’s high population density, green space occupies an important place in its urban mosaic. Given the limited research on quantifying and modeling the hydrologic processes of urban green space and potentially its relative importance in Singapore, the objectives of this paper are twofold. First, we quantify the rainfall–runoff processes for a public park in Singapore and second we explore the efficacy of PCSWMM in estimating runoff from a nearly 100% pervious area in the park. Singapore, located just over 1° north of the equator, receives an average of 2 400 mm rain per year. Stormwater runoff management to minimize localized flooding is essential, but given the volume of rainfall, also is a challenge. Green space therefore has an important role in runoff management. Located in the suburban town of Woodlands in the northwest of Singapore, Admiralty Park contains a 20 ha nature area and 7 ha urban park and is adjacent to Republic Polytechnic. Runoff from the park is transported via an underground drainage system that underlies an impervious path. The runoff subsequently discharges to a treatment train that includes a raingarden and two detention ponds, before flowing into a small watercourse, Sungei Cina, and then to the Straits of Johor (Figure 1). The drainage area of the park leading to the raingarden and detention ponds is the focus of this study and although water quality sampling was done to help assess the efficacy of this treatment train, results are not reported here. The drainage area of the park leading to the raingarden and detention ponds is amphitheatre shaped and represents reasonably steep side slopes, averaging 6.8% (Figure 2). Figure 1 Upper Admiralty Park, with Republic Polytechnic buildings to the east (the red arrows represent the direction of flow through the park drains and two detention ponds); Google Earth. Figure 2 DEM schematic of the Admiralty Park study area (the brown shading represents areas of higher elevation while the green represents areas of lower elevation; infiltration rates were measured at sites S1 through S5). Figure 3 Flow and water quality monitoring station. Infiltration rate was measured at 5 sites (Figure 2) in Admiralty Park selected to represent different slope characteristics. For comparison purposes infiltration also was measured at 12 sites in Bishan-Ang Mo Kio Park, a large, newly opened green space in north central Singapore. Infiltration was measured using a Turf-Tec double O-ring infiltrometer that had an inner ring diameter of 64 mm and an outer ring diameter of 110 mm. A falling head measurement approach was used in which readings were taken every 5 min for a duration of 30 min. In Admiralty Park, the infiltration experiments were conducted on 2013-10-30 and 2013-11-18. For the 2013-10-30 experiments, infiltration testing was done from 09.30 to 12:00. The weather was windy on that day and the soil conditions were wet due to heavy rain two days previous. For the 2013-11-18 experiments, infiltration testing was done from 11:30 am to 13:00. The weather conditions were humid and no precipitation was recorded for the previous 3 d; therefore the soil was drier. 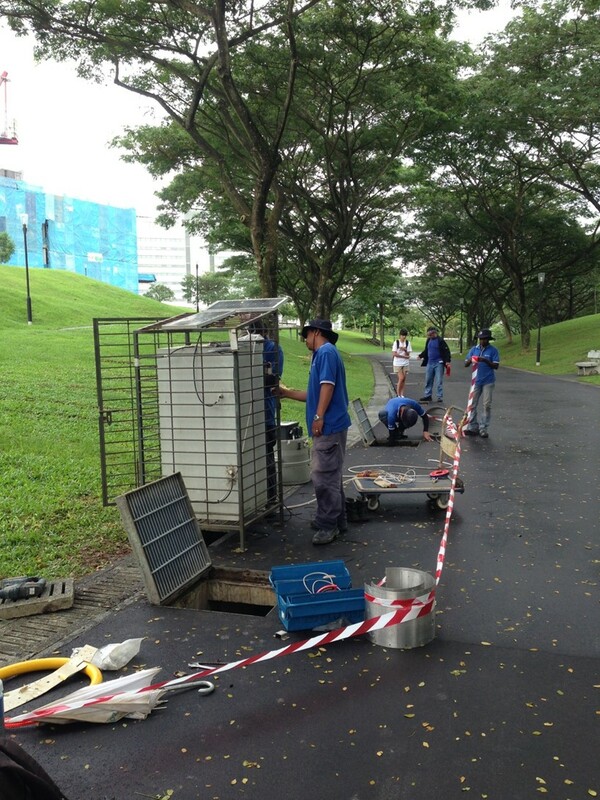 In Bishan Park, the infiltration experiments were done on 2014-01-02 to 2014-01-03 and 2014-01-17. The previous several days for both sample times in January were dry. A combination of standard sieving (inorganic particles >63 μm) and hydrometer (inorganic particles <63 μm) were used to analyze texture of the upper several centimeters of soil at each site. The soils were oven-dried at 110 °C for 24 h and then ground with porcelain pestle and mortar in preparation for the textural analysis. The Admiralty Park catchment area was discretized into 12 subcatchments, as shown in Figure 4. Except for the paved path (Figures 3 and 4) and some small paver-stone areas in subcatchments S8 and S9, the park catchment was 100% pervious. Preliminary runs with PCSWMM showed that the shape of the storm hydrographs (especially the extended recessional limb and peak magnitude) was not captured if only the surface hydrology and infiltration losses were considered. The two options in PCSWMM to consider subsurface hydrology are: explicit representation of groundwater movement using a modified Darcy equation approach; and the more empirical rainfall derived inflow and infiltration (RDII) unit hydrograph approach. Soil parameter values and groundwater data were not available to support the Darcy equation approach and the RDII unit hydrograph approach therefore was used (Figure 5). The Horton infiltration equation was used to represent the infiltration rate. Figure 4 PCSWMM subcatchment and drainage line representation (see Figure 3 for the actual view of the drainage line). Figure 5 RDII unit hydrograph editor in PCSWMM. A review of the data indicated that 12 storms during the monitoring period had a complete record for both rainfall and flow. Rainfall depths for these events ranged between 9.6 mm and 99.4 mm and peak intensities between 42 mm/h and 144 mm/h. There was a strong correlation (0.872) between total storm event runoff volume and total rainfall depth, but weaker correlations between peak rainfall intensity and peak runoff rate (0.234) or peak rainfall intensity and total storm event runoff volume (0.382). Initial measured maximum infiltration for the 5 sites in Admiralty Park ranged between 140 mm/h and 850 mm/h, with an average of 391 mm/h, while the minimum infiltration after 30 min typically approached a low, steady state value of between 38 mm/h and 300 mm/h, with an average of 93 mm/h. In comparison, initial infiltration for the 12 sites in Bishan Park ranged between 24 mm/h and 960 mm/h, with an average of 316 mm/h. Most sites in Bishan Park approached a low, steady state infiltration condition that ranged between 10 mm/h and 775 mm/h, with an average of 219 mm/h. The low values of 24 mm/h initial infiltration and 10 mm/h final infiltration actually were observed for a high pedestrian traffic area adjacent to a public apartment (HDB flat) parking lot near Bishan Park. Bishan Park results are included for comparison purposes to show that while infiltration rates for different parks may show similar general trends through an event, with maximum and minimum values being of the same order of magnitude, there also can be considerable spatial variability in the data and it is prudent to conduct site specific measurements to operationalize PCSWMM. The Admiralty Park samples tended to have higher sand (mean of 87.8%) and clay (mean of 8%) content than the Bishan Park samples, with a mean sand composition of 77% and 2.2% clay. The samples for both parks generally were in the sandy loam or loam sand category. The 1:1 lines between modeled and observed peak flow and modeled and observed event volume for the 10 calibration events are shown in Figure 6 and typical hydrograph results are presented in Figure 7 . For some storm events the flow meter exhibited a temporary lost signal, which made the data noisy at these times, but generally the model performed well, with the Nash–Sutcliffe coefficient for the modeled peak flow being 0.98 and for the modeled event volume being 0.73. The critical parameters for model calibration were the Horton infiltration values and the RDII unit hydrograph shape parameters. The maximum initial infiltration capacity (f0) for the Horton equation was set at either 100 mm/h or 135 mm/h in all subcatchments for the 10 calibration runs, while the final, low constant rate (fc) consistently was 20 mm/h and the decay coefficient (α) consistently was 10/h. Qualitatively, events with lower peak flows were best calibrated using the higher (135 mm/h) value for f0. The values of fc and f0 were at the low end of the fitted Horton equation results for the 5 sites at Admiralty Park. For the RDII unit hydrograph, the value of T (time to hydrograph peak) consistently was 0.21 h, K (falling limb duration/rising limb duration) consistently was 1.2, while R (fraction of rainfall that becomes I/I) ranged between 1% and 75%, with 40% being typical for the majority of events. Results for the two validation events are presented in Figure 8. Because there were only two validation events, the Nash–Sutcliffe coefficient was not calculated, but qualitatively, the modeled flow rates provided a good fit to the observed flow. The f0 value for the January validation event was selected as 100 mm/h since it exhibited a larger peak flow and a value of 135 mm/h was selected for the April event because it had a lower peak flow. The values of fc and α were the same as for the calibration events. The RDII unit hydrograph was removed from the model for the calibration events and the model was re-run keeping the other calibrated parameter values the same, to examine the influence of the RDII approach on model results. The 1:1 lines between modeled and observed peak flow rate rate and modeled and observed event volume for the calibration events are shown in Figure 9 and the 2014-03-17 hydrograph results are presented in Figure 10 for illustration. The inclusion of the RDII unit hydrograph improved model results for the majority of calibrated events, particularly for the larger events. Without the RDII unit hydrograph the modeled flow peaked too early, the recessional limb of the hydrograph declined too rapidly, and the modeled peak magnitudes and volumes were underestimated. It may be possible to improve the model fit without the RDII (e.g. Figures 9 and 10), but this would require adjusting some of the model parameters (e.g. Horton infiltration equation, percent imperviousness, depth of surface storage) to values that would not be realistic or within the observed range. Figure 9 1:1 lines between modeled and observed event peak flow rate (left) and event volume (right), with RDII unit hydrograph removed. 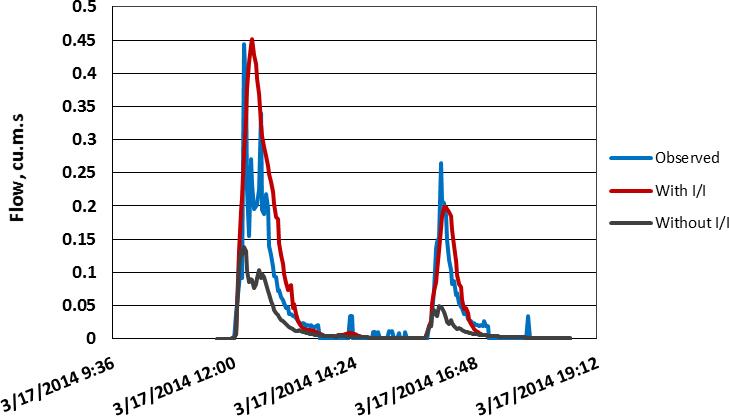 Figure 10 Calibration event for 2014-03-17, comparing with and without RDII unit hydrograph. Consideration of infiltration characteristics is important in assessing runoff patterns for urban watersheds that have extensive green space. Yet infiltration measurements, even with careful control on methodology, can still produce frustratingly variable results due to the nonlinear complexities of the soil–air–water system (e.g. Telis 2001). Infiltration measurements can be impacted by the size of the infiltration rings and whether a constant head or falling head approach is used (Gregory et al. 2005; Dukes et al. 2006). The advantage of a falling head test is that less water is required for the experiments, a consideration for areas that do not have easy access to a water source, as in our case. Infiltration rates determined through the falling head approach may be lower than those determined using a constant head (Gregory et al. 2005; Dukes et al. 2006). The infiltration capacity for residual soils on slopes in three different areas of Singapore was measured by Rezaur et al. (2003) and ranged between 10 mm/h and 2 400 mm/h. The variability of results reflected a number of factors, including bulk density, texture, and relative location on the slope (crest vs toe). These soils tended to have higher silt and clay content than the soils in Bishan and Admiralty parks. Chatterjea (2007) also measured infiltration rates in Singapore, but these were done for natural forest and trail areas of the Bukit Timah nature persevere. The highest initial infiltration rate for a forest soil was recorded as 7 500 mm/h, whereas the more compacted trail areas had initial infiltration rates that could be as low as 20 mm/h. The infiltration rates recorded for Admiralty and Bishan parks certainly fit within the range reported by Rezaur et al. (2003) and Chatterjea (2007), although the values tended towards the low end of the range. Soil compaction in urban areas is common and this will negatively impact the infiltration rate (Gregory et al. 2006; Yang and Zhang 2011). Compaction effects may be compounded by poorer physical properties associated with urban fill soils and a shorter time for profile development (e.g. Jim 1998; Scharenbroch et al. 2005), resulting in lower infiltration rates. Numerous studies have evaluated and compared infiltration estimate approaches, with varying results. For example, Telis (2001) found that the Horton equation adequately fit only 9 of 16 sample soil sites in Florida while Dashtaki et al. (2009) found the performance of the Horton equation was site dependent and affected by soil characteristics. Chahinian et al. (2005) reported that the majority of larger runoff events were well simulated using the Philip, Horton, or Morel-Seytoux modification of Green–Ampt equations at the field scale. Kale and Sahoo (2011) reviewed the strengths and shortcomings of the Green–Ampt equation. Green–Ampt of course is one of the options for representing infiltration in PCSWMM. Duan et al. (2011) found that the Horton and Mezencev models performed better than the Philip, Kostiakov or SCS models in their study of infiltration into lawns, yet Musa and Adeoye (2010) reported that the Kostiakov model better represented infiltration than Horton for soils in Nigeria. 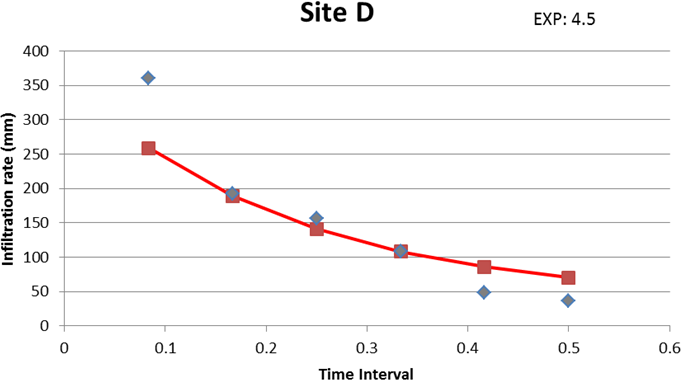 For our study, the Horton equation was adequate, although it tended to underestimate the initial infiltration capacity (f0) (Figure 11) and did not represent conditions well in four of the 12 sites at Bishan Park. Specifically, the measured maximum infiltration capacity (f0) at Admiralty Park ranged between 140 mm/h and 850 mm/h, while for the fitted Horton infiltration equation, the estimated f0 values ranged between 80 mm/h and 690 mm/h. An advantage of the Horton equation, as compared to the Green–Ampt equation, was that while we had a limited number of infiltration measurements, these still provided a planning level guide to easily operationalize and calibrate the equation within the PCSWMM framework. Interestingly, through the calibration process, the decay coefficient that provided the best hydrograph fit (Figures 7 and 8) generally was higher (α = 10/h) than those identified through the infiltrometer measurements (2.5/h to 10/h). Figure 11 Horton infiltration equation (red line) fit to observed infiltration rates at site D in Admiralty Park (the time interval is in fractions of an hour). The RDII unit hydrograph approach to represent soil throughflow in this study is empirical in nature and therefore will require more site specific calibration. The value for R (fraction of rainfall that becomes I/I), in particular, may be difficult to accurately identify and likely will vary from site to site and storm to storm. While the R value did vary between 1% and 75% in this study, a value of 40% was appropriate for most events, including the validation events. It would have been interesting to extend the monitoring period in an effort to quantify the relationship between R and storm event characteristics and explicitly include consideration of antecedent moisture conditions (rather than indirectly through model calibration). It was observed, for example, that two events measured shortly after the 1 in 140 y drought period of 2014-02 exhibited relatively high peak runoff rates. It is unclear whether this phenomenon was due to soil sealing from the drought or soil cracking that produced macropores. Ultimately, the inclusion of the RDII unit hydrograph approach provided a better fit to the event hydrograph than simply considering surface runoff and infiltration loss. 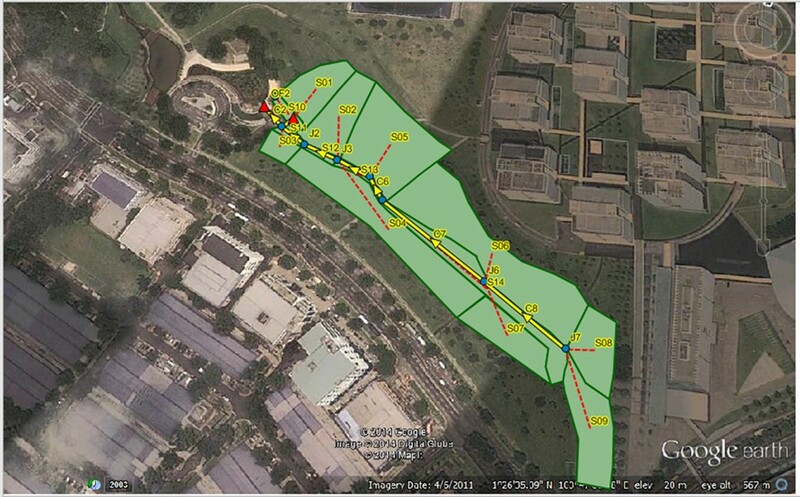 By including the RDII unit hydrograph approach to represent soil throughflow, PCSWMM was able to accurately represent storm runoff from a park area in Singapore that essentially was 100% pervious. The Horton infiltration equation adequately represented the soil infiltration process, although more field measurement for different green space areas under varying soils, slopes, vegetation cover, and antecedent conditions would be beneficial. It also would be beneficial to conduct a thorough field and modeling study to evaluate the different infiltration (e.g. 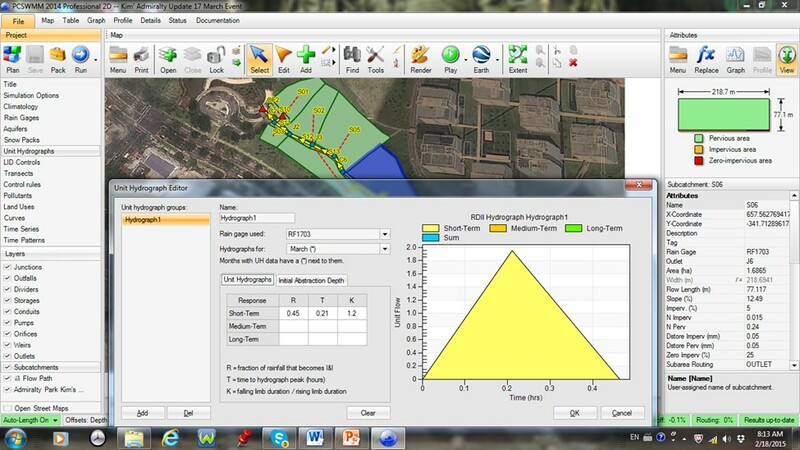 Green–Ampt) and subsurface flow options in PCSWMM. Given the limited number of monitored events, this study does suggest the Horton/RDII approach has useful implications for modeling the stormwater runoff in a tropical country that has extensive green space and harvests its runoff as a municipal water source. The Infiltration measurements in Admiralty Park were conducted by Ms. Liu Mei Jing for her final year project at Republic Polytechnic (supervised by Mr. Martin Fung and Mr. Renny Low), and in the Bishan Park area by Mr. Ong Kheng Loon for his final year project at the National Institute of Education (supervised by K. N. Irvine). Dr. Wu Bing Sheng produced the Admiralty Park DEM based on elevation surveys done in his Introduction to GIS class at the National Institute of Education. Arcadis. 2015. Sustainable Cities Index 2015. https://www.arcadis.com/en/global/. Chahinian, N., R. Moussa, P. Andrieux and M. Voltz. 2005. “Comparison of Infiltration Models to Simulate Flood Events at the Field Scale.” Journal of Hydrology 306:191–214. Chatterjea, K. 2007. “Assessment and Demarcation of Trail Degradation in a Nature Reserve, Using GIS: Case Study of Bukit Timah Nature Reserve.” Land Degradation and Development 18:500–18. Chiesura, A. 2004. “The Role of Urban Parks for the Sustainable City.” Landscape and Urban Planning 68:129–38. Dashtaki, S. G., M. Homaee, M. H. Mahdian and M. Kouchakzadeh. 2009. “Site-dependence Performance of Infiltration Models.“ Water Resources Management 23:2777–90. De Ridder, K., V. Adamec, A. Banuelos, M. Bruse, M. Burger, O. Damsgaard, J. Dufek, J. Hirsch, F. Lefebre, J. M. Perez-Lacorzana, A. Thierry and C. Weber. 2004. “An Integrated Methodology to Assess the Benefits of Urban Green Space.” Science of the Total Environment 334–335:489–97. Duan, R., C. B. Fedler and J. Borrelli. 2011. “Field Evaluation of Infiltration Models in Lawn Soils.” Irrigation Science 29:379–89. Dukes, M., G. Miller and J. Gregory. 2006. “Measuring Water Infiltration Rates.” Irrigation & Drainage October:22–9. Fuller, R. A., K. N. Irvine, P. Devine-Wright, P. H. Warren and K. J. Gaston. 2007. “Psychological Benefits of Greenspace Increase with Biodiversity.” Biology Letters 3:390–4. Gregory, J. H., M. D. Dukes, G. L. Miller and P. H. Jones. 2005. “Analysis of Double-Ring Infiltration Techniques and Development of a Simple Automatic Water Delivery System.” Applied Turfgrass Science. https://doi.org/10.1094/ATS-2005-0531-01-MG.
Gregory, J. H., M. D. Dukes, G. L. Miller and P. H. Jones. 2006. “Effect of Urban Soil Compaction on Infiltration Rate.” Journal of Soil and Water Conservation 61 (3): 117–24. Howett, C. 1998. “Ecological Values in Twentieth-Century Landscape Design: A History and Hermeneutics.” Landscape Journal 17 (2): 80–98. James, P., K. Tzoulas, M. D. Adams, A. Barber, J. Box, J. Breuste, T. Elmqvist, M. Frith, C. Gordon, K. L. Greening, J. Handley, S. Haworth, A. E. Kazmierczak, M. Johnston, K. Korpela, M. Moretti, J. Niemela, S. Pauleit, M. H. Roe, J. P. Sadler and C.W. Thompson. 2009. “Towards an Integrated Understanding of Green Space in the European Built Environment.” Urban Forestry & Urban Greening 8:65–75. Jim, C. Y. 1998. “Soil Characteristics and Management in an Urban Park in Hong Kong.” Environmental Management 22 (5): 683–95. Kale, R.V. and B. Sahoo. 2011. “Green-Ampt Infiltration Models for Varied Field Conditions: A Revisit.” Water Resources Management 25: 3505-3536. Leby, J. L. and A. H. Hashim. 2010. “Liveability Dimensions and Attributes: Their Relative Importance in the Eyes of Neighbourhood Residents.” Journal of Construction in Developing Countries 15 (1): 67–91. Marsh, W. M. 1991. Landscape Planning Environmental Applications, 2nd ed. New York: Wiley. McPherson, E. G. 1992. “Accounting for Benefits and Costs of Urban Greenspace.” Landscape and Urban Planning 22:41–51. Millward, A. A. and S. Sabir. 2011. “Benefits of a Forested Urban Park: What is the Value of Allan Gardens to the City of Toronto, Canada? Landscape and Urban Planning 100:177–88. Musa, J. J. and P. A. Adeoye. 2010. “Adaptability of Infiltration Equations to the Soils of the Permanent Site Farm of the Federal University of Technology, Minna, in the Guinea Savannah Zone of Nigeria.” AU Journal of Technology 14 (2): 147–55. Ng, X. Y. X. 2015. “A Study of Urban Heat Island using Local Climate Zones—The Case of Singapore.” British Journal of Environment and Climate Change 5 (2): 116–33. Okulicz-Kozaryn, A. 2013. “City Life: Rankings (Liveability) Versus Perceptions (Satisfaction).” Social Indicators Research 110:433–51. Pauleit, S., R. Ennos and Y. Golding. 2005. “Modeling the Environmental Impacts of Urban Land Use and Land Cover Change—A Study in Merseyside, UK. Landscape and Urban Planning 71:295–310. Rezaur, R. B., H. Rahardjo, E. C. Leong and T. T. Lee. 2003. “Hydrologic Behavior of Residual Soil Slopes in Singapore.” Journal of Hydrologic Engineering 8 (3): 133–44. Rybczynski, W. 1999. “Why We Need Olmsted Again.” Wilson Quarterly 23:15–21. Sanders, R. A. 1986. “Urban Vegetation Impacts on the Hydrology of Dayton, Ohio.” Urban Ecology 9:361–76. Scharenbroch, B. C., J. E. Lloyd and J. L. Johnson-Maynard. 2005. “Distinguishing Urban Soils with Physical, Chemical and Biological Properties.” Pedobiologia 49:283–96. Sherer, P. M. 2006. The Benefits of Parks: Why America Needs More City Parks and Open Space. San Francisco: The Trust for Public Land. Swanwick, C., N. Dunnett and H. Woolley. 2003. “Nature, Role and Value of Green Space in Towns and Cities: An Overview.” Built Environment 29 (2): 94–106. Telis, P. A. 2001. Estimation of Infiltration Rates of Saturated Soils at Selected Sites in the Caloosahatchee River Basin, Southwestern Florida. Tallahassee, FL: U.S. Geological Survey. Open File Report 01-65. http://fl.water.usgs.gov/PDF_files/ofr01_65_telis.pdf. The Trust for Public Land. 2014. 2014 City Park Facts. San Francisco: The Trust for Public Land. Yang, J-L. and G-L. Zhang. 2011. “Water Infiltration in Urban Soils and its Effects on the Quantity and Quality of Runoff.” Journal of Soils and Sediments 11 (5): 751–61. Yuen, B. 1996. “Creating the Garden City: The Singapore Experience.” Urban Studies 33 (6): 955–70.